The history of Abingdon has always been shaped by the agricultural heritage of its surroundings – communities where cows outnumbered people for generations, where tobacco fields provide many families’ entire livelihood, and where the labors of Depression-era farmers helped spark the creation of the Barter Theatre. Even with the decline of commercial agriculture as a leading industry, farmers around Abingdon have consistently found ways to market their products to their neighbors. Abingdon Farmers Market vendor Charlie Foster has been farming since childhood. Now in his seventies, Foster has seen the evolution of the present-day market firsthand. Forty years ago, he said, he and his neighboring farmers would sell produce out of the beds of their pickup trucks wherever they knew people would find them. 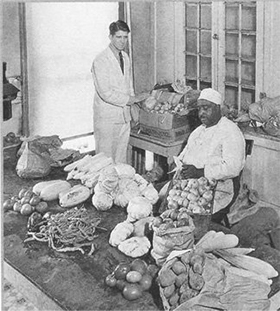 Eventually, these little roadside marketplaces became more established,and customers began to count on the half dozen farmers that would gather at certain regular spots most Saturdays: first outside an old Kroger on Main Street, then in the parking lot across from Sinking Spring Presbyterian Church. It wasn’t until 2001 that a handful of farmers decided to organize a more formally structured market, and requested the use of town property to host it. 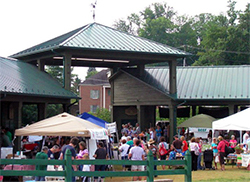 With extensive support from Appalachian Sustainable Development, which guided the process of creating a steering committee and crafting a clear vision, the market doubled in size from its original six vendors within that first season, and quickly outgrew the parking lot beside the historic Fields-Penn House, where it was held. Over the next four years, AFM met at the Latture Field parking lot and steadily increased its vendor list to over 70. With momentum growing, conversations about a possible permanent facility, initially suggested by the then-town planner and faithful shopper, Al Bradley, quickly turned to firm plans. The town agreed on a location, and support from Washington County, as well as the Tobacco Indemnification Commission brought the funds needed to build a covered structure to house the market permanently. Midway through the 2007 season, the market pavilion on Remsburg Drive began opening for business each Tuesday and Saturday, and the already rapid growth of the market intensified, with nearly 100 vendors participating over the course of that season. Since then, through the efforts of AFM’s many hardworking vendors, steering committee and market manager, the market has become a cherished place for shoppers and farmers alike. The market has added live music, cooking demonstrations, TomatoFest and SquashtoberFest celebrations, a Holiday Market, and even bi-monthly market days through the dead of winter. It has educated children through the Farm Fresh Kids program and reached out to low-income and elderly shoppers buying local produce with Supplemental Nutritional Assistance Program benefits and Senior Farmers Market Nutritional Program vouchers. Today, the Abingdon Farmers Market has established itself as not just a consistent source of high-quality, locally-grown food, but also as a fixture of a community re-connecting to its deep agricultural roots.